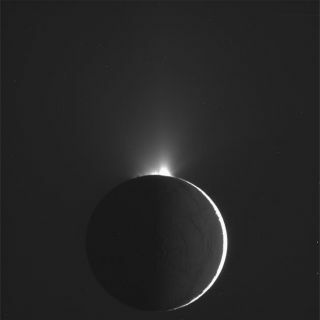 This raw, unprocessed image of Enceladus was taken by NASA's Cassini probe on Nov. 2, 2009. Bright plumes of water vapor are visible on the moon's south pole. Striking new photos of water-vapor geysers erupting from Saturn?smoon Enceladus were beamed to Earth this week by NASA?s Cassini spacecraft inorbit around the ringed planet. Cassini made its deepest dive yet into the plumes pouringout from the moon?s south pole on Nov. 2 during a planned flyby ofEnceladus. The spacecraft approached within about 62 miles (100 km) of themoon's surface. The powerful plumes, which contain water vapor, sodium andorganic chemicals such as carbon dioxide, look a bit like the Old Faithfulgeyser in Yellowstone National Park. They have intrigued scientists becausethey suggest that a store of liquidwater may be present beneath the moon's crust to give rise to the watervapor in the plumes. And if there is liquid water, there might be thepossibility of some kind of alien life. "If we can put the pieces together - a liquid oceanunder the surface, heat driving the geysers and the organic molecules that arethe building blocks of life - Enceladus might turn out to have the conditionsthat led to the origin of life on an earlier version of Earth," Cassiniscientist Bonnie J. Buratti wrote on NASA's Jet Propulsion Laboratory blog. The aim of the recent flyby - Cassini's seventh targetedswoop toward Enceladus - was to measure the size, mass, charge, speed andcomposition of the particles within the plume. The spacecraft made a quickapproach traveling at about 18,000 mph (nearly 29,000 kph). In addition to thescientific data, the spacecraft returned new stunning snapshots showing the enigmaticgeysers glowing in reflected sunlight against the dark backdrop of space. "Not too bad being in orbit around Saturn, is it ?! ;-)"wrote Carolyn Porco, head of Cassini's imaging science team, via Twitter. Porcocalled the images "spectacular." The joint U.S.-European Cassinispacecraft was launched in 1997 on a mission to orbit Saturn, anddiscovered the geysers on Enceladus in 2005. The spacecraft completed itsprimary mission in 2008 and is currently in the middle of an extended phasethat runs through 2010. "This is the first time we?ve found activity on a moonthis small," Buratti wrote, explaining that Enceladus is only about thewidth of Arizona, with a diameter of 310 miles (500 km).